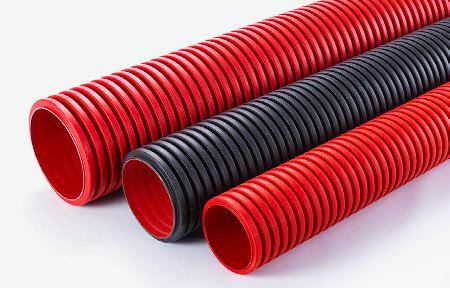 Polypipe cable duct and underground cable protection range of products are independently certified to British and European Standards and are used extensively for highways, housing developments, commercial, retail and industrial infrastructure applications. Under agreement with Polypipe, T&D provide a nationwide delivery service for Polypipe Cable Duct via a network of 15 stocking depots. This includes Polpypipe Ridgiduct Class 1 and Class 2 power cable duct for low voltage (LV) and high voltage (HV) cables up to 33kV, including 11kV Triplex Cables. Polypipe Ridgiduct power cable duct meets ENATS 12-24 (ESI) for underground cable protection - rail, street lighting, fibre optic, motorway comms, PV solar and utility cable ducts for waveform cable are available from stock. High voltage cable duct for 66kV, 132kV and 275kV cable is also available to provide underground cable ducting for associated pilot, telephone and fibre optic cables for UK DNO’s and contractors. T&D supply the complete range of Polypipe Cable Ducting - this includes ducting for power cables, street lighting cable duct, motorway communications and a broad range of utilities.